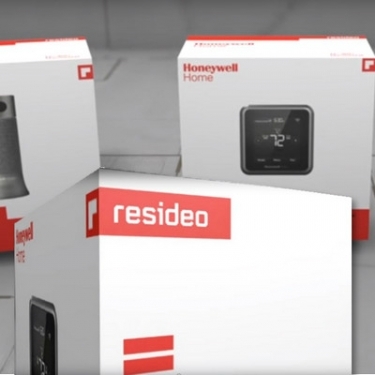 Honeywell is spinning off its ADI distributing and ‘Honeywell Home’ automation and security units at the end of this year, calling the new publicly traded company Resideo. Products from Resideo will go to market under the Honeywell Home brand as part of a long-term licensing agreement with Honeywell. Honeywell (NYSE: HON) has introduced Resideo as the corporate name of the Honeywell Homes product portfolio and ADI global distribution businesses. The two businesses will become a stand-alone, publicly traded company following completion of a spinoff that is expected by the end of the year. Honeywell will license its brand to Resideo under a long-term agreement for use in its home comfort and security hardware, and software solutions for all channels, according to an announcement. “The home is the biggest investment most of us will ever make — the place where we create a lifetime of memories,” says Mike Nefkens, president and CEO, Honeywell Homes, the business that will become Resideo. Resideo will go to market with several distinct advantages, states Roger Fradin, the company’s chairman of the board. These include: a pipeline of innovative products and services, a sharp focus on its customers and global scale with a world-class brand. “Given its ability to serve a wide range of customers around the world, Resideo is poised to be the preferred choice for consumers and channel partners and a very compelling investment for shareowners,” says Fradin. Resideo will benefit from a large network of professional partners and customers who buy and support the Honeywell Home line of products. This network includes more than 110,000 contractors, who are an integral part of Resideo’s sales and go-to-market strategies, according to the company. As an independent company, Resideo will support their growth by investing in sales and technical training, improving channel partner marketing and related programs to enhance their ability to meet the needs of homeowners, according to the announcement. The network also includes more than 3,000 distributors and 1,200 OEMs, major retailers and online merchants. More than 4.7 million of Resideo’s customers are said to use connected devices in their homes, which provide them app-based access to controls, monitoring, and alerts. Following the spinoff, the new company will already have approximately 30 million installed sensors generating more than 250 billion data transmissions annually. The ADI Global Distribution business has more than 200 physical locations in nearly 20 countries, offering more than 350,000 products to more than 100,000 contractors. ADI will retain its name and remain as a standalone distribution business of Resideo. Resideo. What a stupid name. Means nothing to the average person. Doesn’t tell me what it is, like RING. Someone in marketing should be fired.